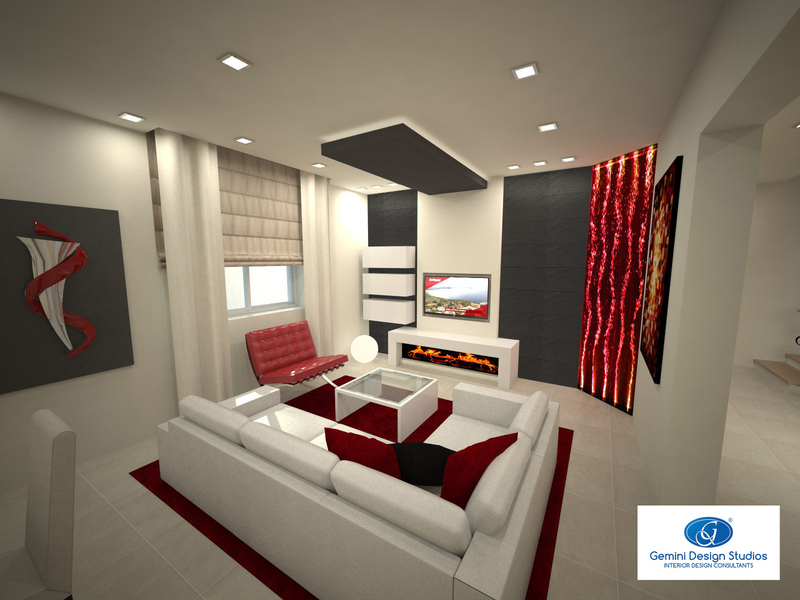 LATEST PROJECT – TRANSFORMING A TERRACED HOUSE IN MQABBA INTO A UNIQUE & FUNCTIONAL MODERN HOME | Interior Design Malta – Gemini Design Studios Ltd. The clients were very straightforward….they wanted an empty house changed into an abode worthy of unwinding in plush and comfortable settings after a hard day’s work. The task was far than simple, considering they had extra space for two living rooms and two teenagers inclined for musical entertainment. Upon entering the residence one is welcomed by a sense of openness. We took the opportunity to insert a white gloss unit and bench as a shoe storage space to avoid unnecessary clutter. 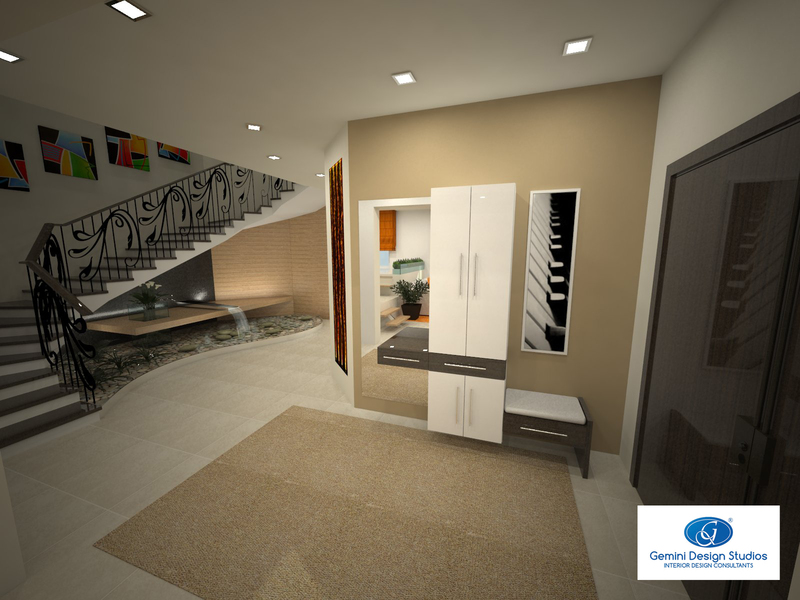 The unutilised space beneath the staircase was an invitation to create a sensual feature. We managed to create a sense of peacefulness through the free-flowing water streaming on the underlying pebbles surrounded by watery vegetation. 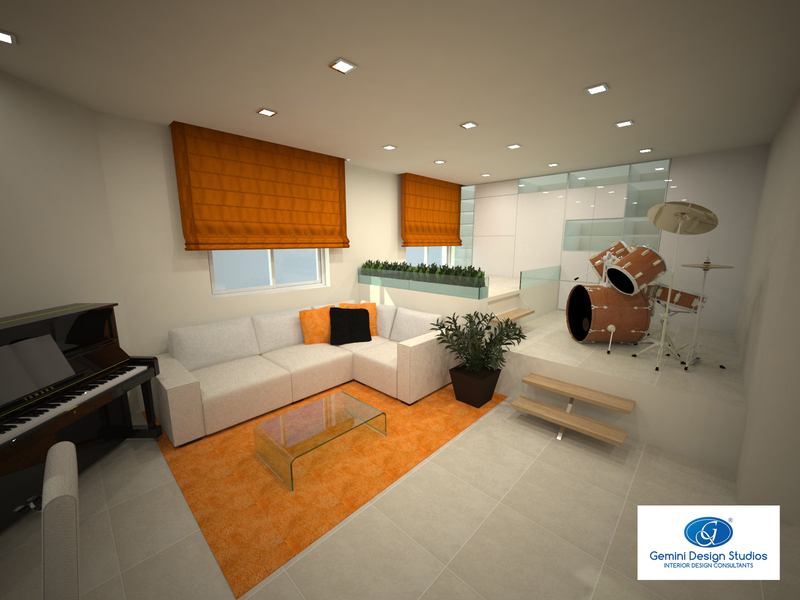 The first room upon entering the residence was changed to an informal music room with tones of subtle orchid and orange for a relaxing mood and adequate space for all the musical instruments and paraphernalia. The idea was to separate the young entertainers from the more formal living room across the corridor. The result was a functional room added with plenty of storage space at the rear. The living room is adorned with different textures such as slate and rough marble for the mantlepiece, as well as adding splashes of colours to balance the dark features. A hanging sculpture attracts the attention of the visitor, as well as a bubble wall tucked in a corner, which is also an interesting feature, inserted mainly to add movement and a sense of serenity. 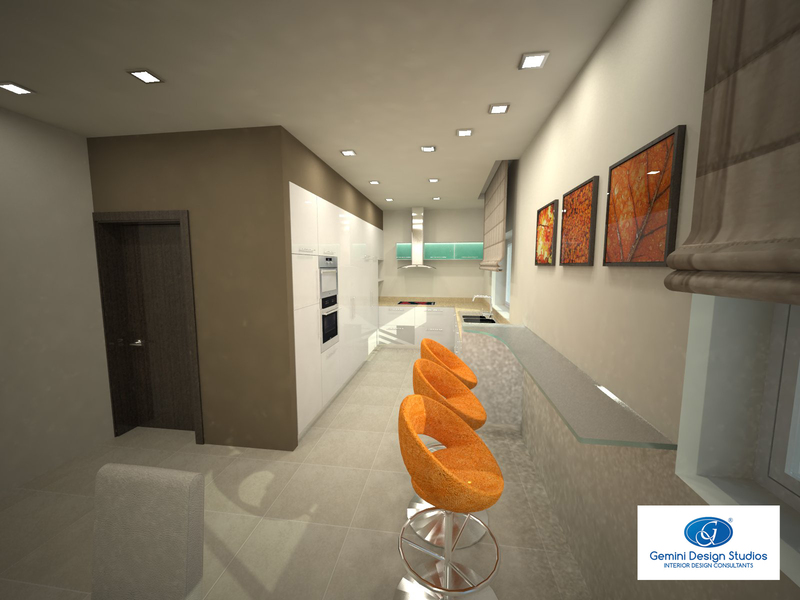 Finally we managed to create a functional kitchen with all modern amenities. A special feature in this kitchen is a ‘kitchen in a kitchen’. An apposite unit has been created with sliding doors, which houses all the kitchen clutter, which when unutilised, will be hidden neatly away from the prying eyes, leaving a sense of cleanliness throughout. The result is a functional and fresh-looking kitchen finished in gloss white with contrasting tones of beige for maximum effect. The stools were given the tone of ochre to add character to the already elegant room.